TOKYO -- Takata Corp., the airbag supplier behind the auto industry’s largest overall recall, projected burning through almost a quarter of its cash over the next year if repairs continue at the current pace, a person familiar with the matter told Bloomberg. Cash and cash equivalents may drop to 49.7 billion yen ($456 million) by the end of March 2017, said the person, who asked not to be identified because the internal forecast is confidential. Takata reported 65.6 billion yen on its balance sheet as of the end of December. The estimate highlights the risk to Takata’s viability posed by airbag inflators that deploy too forcefully and explode, spraying metal and plastic shards at vehicle occupants. The defect has prompted recalls by more than a dozen auto manufactures. The company has estimated a comprehensive callback of the inflators would involve 287.5 million units and cost about 2.7 trillion yen, a person familiar with the matter said last month. Takata has a market value of about $300 million. A representative at Tokyo-based Takata declined to comment. The cash projection took into account estimated costs from lawsuits and payments owed to automakers and regulators, the person said. Takata is seeking sponsors that would increase its capital and allow the supplier to emerge as a new company after restructuring and ensuring product quality, the person said. The supplier would pay a dividend to the sponsor, which it hopes to finalize by September, according to the person. 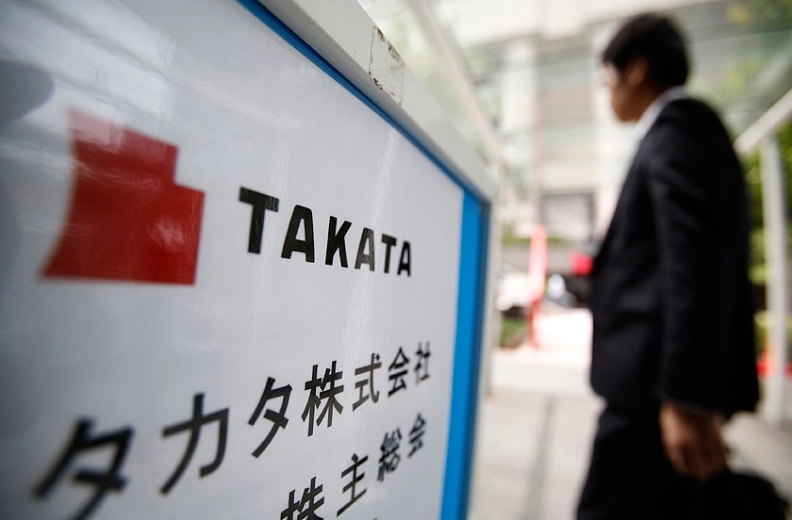 Reuters and the Nikkei reported Takata’s plans to seek a sponsor on Tuesday.